Many people distress cabinets and make them look older by using wax. The wax distressing method comes about when beeswax or even candle wax is applied, and later when the top coat is removed, a distressed look is the result. Beeswax distressing allows the cabinets to have a textured look with the wood or paint underneath showing through, which gives them an antique look. Beeswax is one of the best types to use, but tinted wax is also available. It is a very simple technique that works on the principle that oil and water don’t mix. In most situations, you focus on removing any oil that could be on the cabinets. With beeswax distressing, you are going to put the beeswax over the existing cabinet finish (or a fresh new finish) so the final layer of finish is easier to wipe away when it dries. For existing cabinets, simply apply the wax on the cabinet so the wax lays on in streaks. You don’t want to cover the entire area. You just want to apply wax to areas that would normally experience heavy wear such as edges and high spots. Put layers of wax on the corners, since these are places that normally see the heaviest use and wear and tear throughout the years. Rub wax on other spots to give them an old, beat up look. Allow the wax to dry. You may place a second coat on the cabinets if you desire. Once that’s dry, use a medium grade sandpaper to sand away some of the wax. This allows the bottom layer to show through (wood or paint) when you are finished. 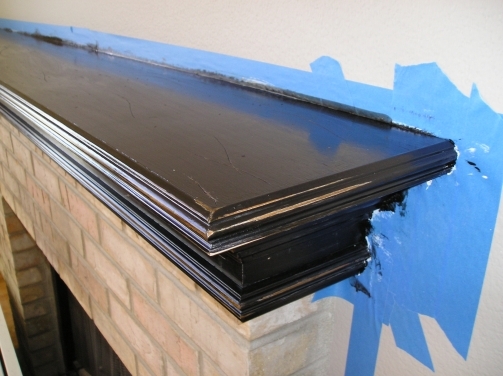 If your base layer is paint, you’ll paint right over the wax in a different color. After the paint has dried, use a sponge sanding block to encourage the top layer to come away wherever there is beeswax. If your base layer is wood, you’ll use a different color of stain for the top layer. The beeswax will prevent the stain from penetrating. Chances are you’ll be able to just wipe off the stain wherever you’ve put beeswax. For an unfinished cabinet, start by painting, preferably with a latex paint. Allow paint to dry to the touch. That’s usually about 25 minutes, depending on the paint. Before the second coat of paint goes on, rub some beeswax or candle wax on the cabinet. Focus on the corners and other areas that see use and wear and tear. Use an ample amount of wax. Follow up with coarse sandpaper and scratch off some of the places where you rubbed on the wax. How much you choose to expose is up to you. Once you have finished placing the wax, paint on your top coat. Latex flat doesn’t clean well in kitchens so use a low-sheen pearl or eggshell paint if you want an older, traditional look. Allow to dry. When dry, use a clean cotton rag to remove any paint that easily comes off. This will mostly be over the waxed spots. Then use medium to coarse sandpaper and remove more paint. This will further distress the cabinet. Step back frequently and monitor the results so you retain control of the distressing process. Remove paint as you see fit. Removing the top coat from the waxed area should be done within a 24 hour period, or else the wax may dry out. Before attempting this entire process, experiment on a scrap piece of wood to ensure you get the feeling of what the effect does, and how it will look on your cabinets. As a final option, apply a final antique wax or glaze to the entire surface to add an additional hand-rubbed and aged patina.